There is a bread to be made for every occasion and this one would do nicely for an anniversary brunch or an engagement buffet. But it would also do fine for everyday as it can be scored in myriads of ways. Under its fancy collar, it is just a regular miche. For the stencil, I used an old ornament given to me by one of my friends, scoring around it. I used rye in it and some of the marvelous high-extraction organic flour that Steve, from Bread cetera, brought me a few weeks ago. This flour is difficult to get (you may have to go through a restaurant that bakes its own bread or a restaurant supply store) and may be replaced by sifted whole wheat bread (although I can’t vouch for that since I have not tried it yet). The dough was mixed directly in the bread machine but I hovered over it when the mixing started as I am not very familiar with this flour and wasn’t sure how it would absorb water. I actually had to add some all-purpose unbleached flour (about 100 g) as the dough was too wet and sticky at the start to even start holding together. If using other flour, you may not need to adjust that much. The recipe is loosely based on the miche formula which was given to me this winter during the second workshop I attended at the San Francisco Baking Institute. This bread will be submitted to Susan, from Wild Yeast, for Yeastspotting. A beautifully decorated loaf! 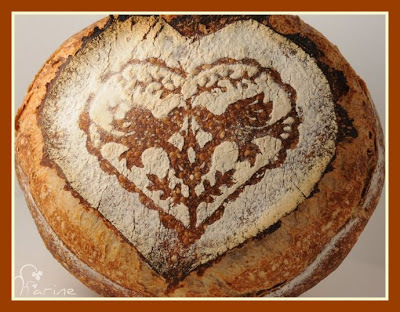 It would be an ideal loaf to bake for Valentine’s Day. Absolutely beautifully decorated, I agree with Steve! With what kind of cutter/knife/blade? 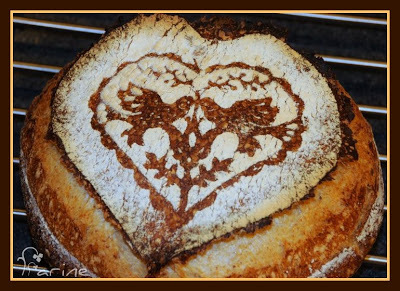 do you score your bread so neatly around the stencil? How to be sure the stencil doesn’t stick to the dough? I would’nt dare try it at home. At the SFBI, did they use that method of putting the Dutch oven in a cold oven and then bake the bread for 45-60 min? You wrote “10. Let rise for about 1hr30”. Why “about”? Did you take it out just because the dough looked OK? 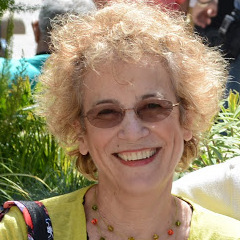 Thank you, Steve and Flo! Yes, this loaf would be great for Valentine’s Day! I’ll have to remember it next year. Flo, I always do the scoring with a small cutter as it is what works best for me. You can never be sure the stencil won’t stick to the dough. This time, it did, a little bit, but I lifted gently and it came off. No, they never used the Dutch oven method at SFBI and never baked straight in a cold oven. But they were very interested when I told them that it was what I did, most of the time anyway. It is very convenient, cheaper and greener, plus it works beautifully, so why not? But it cannot be done on a large scale in a professional setting, which is presumably the reason they don’t do/teach it at SFBI. I wrote “about 1 h 30” because it may take a while longer if the kitchen is really cold, or less if it gets warmer. I do the fingerprint test and it springs back slowly, then it’s ready. That high-extraction miche formula is one of my favorites. You have dressed the loaf up so beautifully here, really outdone yourself! Farine that loaf is a work of art, just pure beautiful. 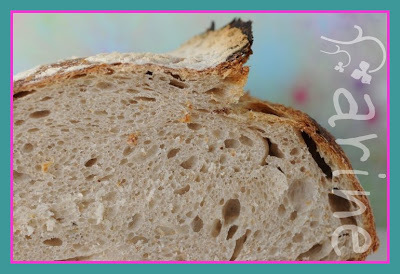 Beautifully decoration and scoring and great looking crumb! I’d take a slice or three! This is a work of art so beautiful that I would hesitate to eat it – for at least a minute. Very, very nice. This bread is so beautiful! The ornament is perfect and crumb looks very nice, too!